This pie is for lovers of pies with cheese and apples. Not Cheddar, but Maytag® Bleu! 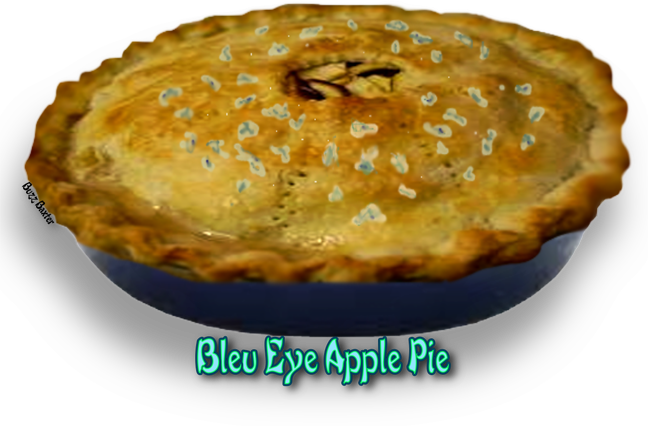 If you try this pie I would love to hear from you. It is different, but so am I. •  1/8 inch slice of blue cheese or crumbles. be no more than 1/2 - 3/4 inch at the widest point. shrink. This step makes for a denser filling. 1. Preheat your oven to 425ºF. Place a sheet pan in the second to the lowest rack. the cold water. FOR A FLAKY CRUST DO NOT OVERWORK THE DOUGH. 4. Divide your dough in half and wrap in plastic wrap and put in the refrigerator for about 1/2 hour. 2  Evenly sprinkle the 3/4 cup bleu cheese over the top of the apple slices. distribute over the contents of your pie. pinch the top and bottom crust together as you go around the pie. 1. Cut a 3/4 inch hole in the top crust in the exact center of the pie as a vent. a circle around the enter hole. 3. Take your egg wash and with a pastry brush,  paint the top of the pie with the wash.
4. Sprinkle the tablespoon of crystalline sugar or granulated sugar evenly over the top of the pie. 2. Place the pie in your preheated oven for 35-40 minutes. golden brown that you desire. 4. Turn oven off and sprinkle the remaining 1/4 cup of bleu cheese crumbles  over the top of the pie. Just as they begin to melt,  remove the pie and cool at least 2 hours before serving.